Mid-summer each years sees Thais across the Eastern Seaboard engage in two days of ceremony and meditation as they mark one of the most important religious holidays and the start of Buddhist Lent. Residents bring wax candles to their local temples. Asalaha Bucha Day and Khao Phansa were celebrated across the region July 19-20 with candle parades, temple processions and plenty of praying. Chonburi held its candle parade July 15 with Gov. Khomsan Ekachai hosting the opening ceremony. The province has organized official celebrations for more than 60 years in conjunction with the Culture Council and private groups. Interim Pattaya Mayor Chanatpong Sriviset and local officials present candles and offerings to monk at Wat Chonglom in Naklua. This year eight organizations participated and winners were Chonburi Vocational Education College, which took home the 8,000-baht first-place prize, Chonradsa­dornumrung School taking second and Prapatsorn Wittaya School third. Honorable mentions went to the Chonburi City Hall, Technology School of Chon­buri, and Sathaporn Wittaya School. 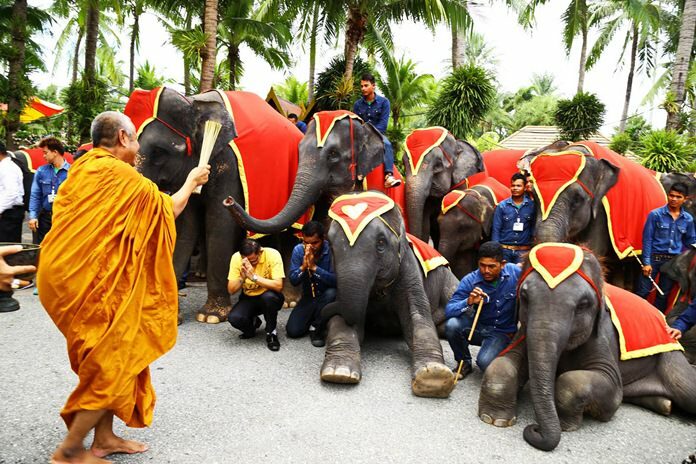 A revered monk blesses the elephants at Nong Nooch Tropical Garden. The Chonburi Provincial Administration Organization also used the occasion to award 220,500 baht in scholarships to 150 needy students. Moreover, Chonburi purchased 400 wax candles to give away to local temples in all districts. 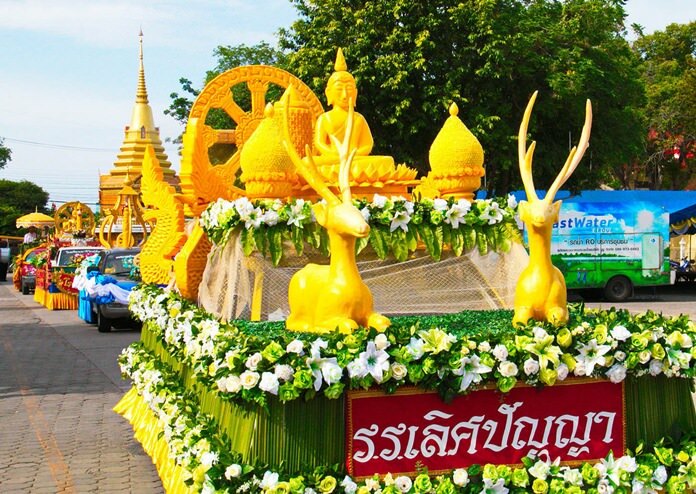 Cultural Council Chairman Samart Tiengpoonwong said the candle parade has been improved each year and is important for locals to join as it keeps religious tradition alive. The Chonburi Provincial Administration Organization used the occasion to award 220,500 baht in scholarships to 150 needy students. In Sattahip, secretary Maj. Chartchai Sripho-on led the district’s parade competition participated in by 46 groups at Sattahip Temple. The procession followed a route around the temple and was considered one of the biggest candle parades in the area. After completing three rounds around the temple, the most beautiful, unique and well-created candles were judged with Thammasiri Suksa School taking first place. 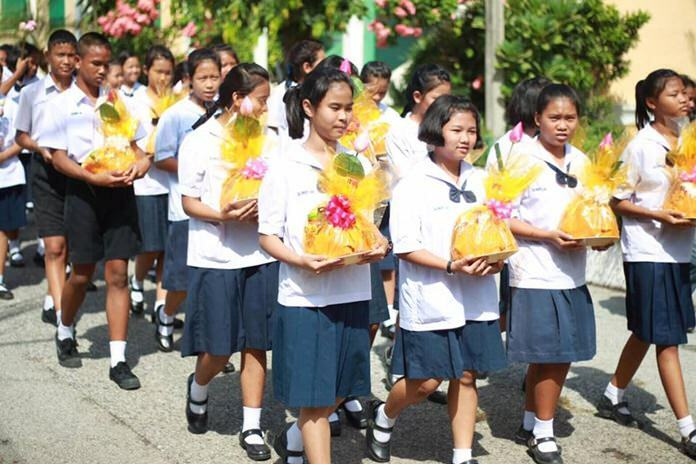 Students take part in the parade from Chonglom Temple to Pattaya School No. 2. Pattaya marked Buddhist Lent with a candle parade from Chonglom Temple. Students, local officials and residents joined in the 9 a.m. procession from the wat to Pattaya School No. 2 July 15. The parade ended with an offering ceremony. Nong Nooch Tropical Garden held a procession during their 9 candles in 9 days for 9 temples event, which included Thai dance. Residents gathered again on July 20, the start of Lent, at their local temples for the blessing ceremonies. It was on this day that all those candles created for the occasion officially were offered to monks as symbols to remain devoted to dharma during the next three months when they will be confined to temple grounds. 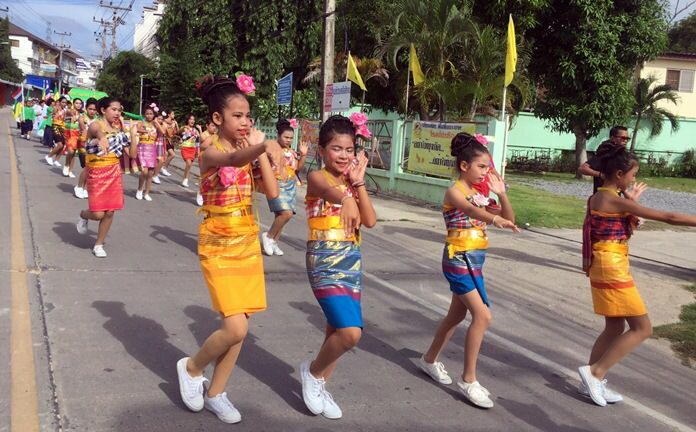 Young dancers perform in the candle parade from Sawangboriboon School to Wat Sutthawat in Nongprue. In the early morning, many Pattaya residents were seen at local temples making merit, donating cash and wax candles according to their budgets. This year’s Pattaya’s candle donations were given to 14 temples and religious institutes, including Phutworaram, Jittaphawan, Sawangfa, Nongyai, Thamsamakee, Chaimongkok, Photisampan, and Maisamran temples, as well as schools at Nong-Or, Nongchumhed, Sankrating­thong, and Khao Prayai temples. Nong Nooch Tropical Garden prepared for the start of Buddhist Lent by molding nine large candles to contribute to nine area temples. 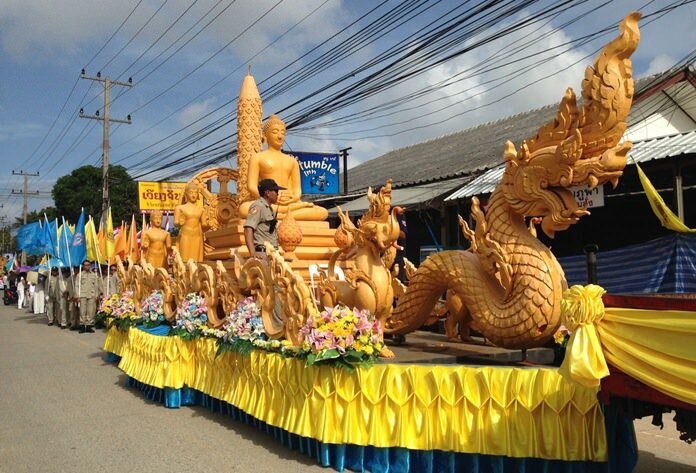 In Sattahip, the district’s parade competition was participated in by 46 groups at Sattahip Temple. The procession followed a route around the temple and was considered one of the biggest candle parades in the area. Park Manager Pattanan Kantisukphan opened the candle-crafting ceremony July 9. Silsarathikul, dean of Sattahip District monks and Abbot of Khao Kanthamart Temple led a procession of park executives and 19 elephants in crafting the candles. 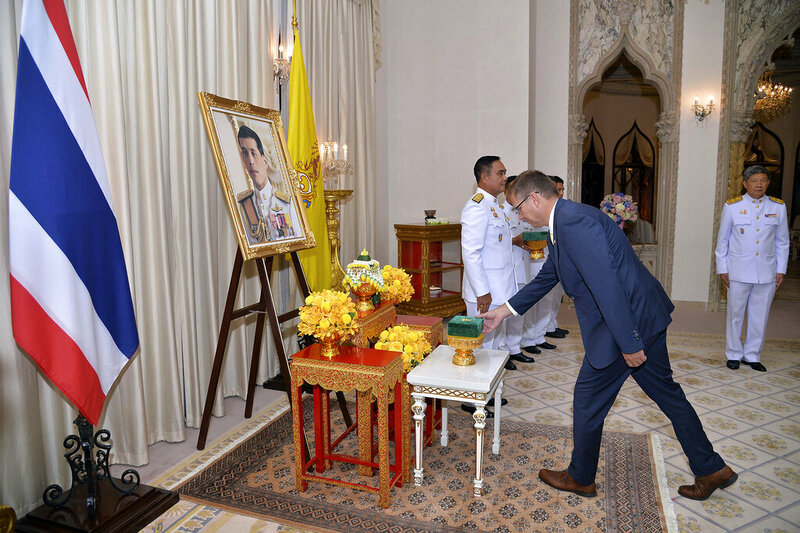 The candles were donated July 20 to Yansangwararam, Samakkee Banprot, Amparam, Bang Saraekongkaram, Na­jomtien, Khao Kantamart, Nong Jubtao, Khao Cheechan, and Sattahip temples. Pattanan said the molding ceremony was a good opportunity for both Thais and foreigners to be a part of the religious tradition. Candles are a key symbol in Buddhist Lent, or Khao Phansa. Tradition states that monks must reside inside their temples for three months for a “rains retreat”, so as to avoid trampling on rice crops during the wet growing season. In earlier times, they needed candles to see inside the temples so they could study dharma. 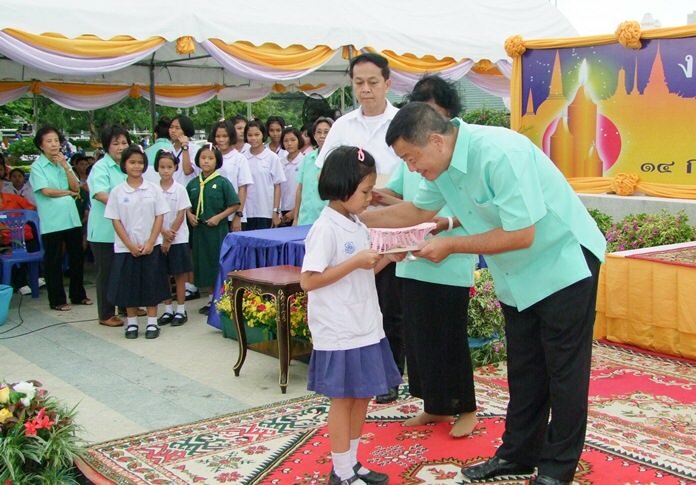 Local schools, including all of Pattaya’s public schools, organized their own candle parades to their local temples.